Do you have good balance? You may not realize it, but having good balance is essential to do everyday tasks, such as walking or carrying a backpack or purse. Even though it seems like balancing is an easy thing to do, for some people it isn’t. People start to lose balance as they age. Injuries from falls become more common with adults and stroke patients. To combat this, people can use balance training to reduce the risk of falls and serious injury. Balance is one of four core types of exercising. The others being strength, endurance and flexibility. Practicing all these types of exercises every day is ideal for a well-rounded workout, but it might be too time consuming for most. To improve balance, training should be done at least three days a week for about 30 minutes. Try starting from the basics exercises and work your way up to more challenging ones. The more challenging the exercise the better you will become at balancing. If you are a beginner to balance training, try balancing by just using your body with no products. A good start would be balancing on one foot. You can do this by grabbing one leg and bending it backward and holding that position for 10 seconds. Next, switch to balancing on the other foot and see how you do. Another good balance exercise to start out with is trying to walk normally in a straight line. This would involve placing one foot in front of the other without stepping out of the straight line. For a more challenging approach to balance, try adding balance pads and boards to your training. The MVP® Balance System is the perfect tool to use to work up to more challenging balance exercises. By simply changing the color-coded instability balls on the back of the board, you can progressively improve your balance. Each ball is a different height, so you can easily modify your balance challenge by increasing the height of the ball. Another balance tool you can use is a balance pad. This product can enhance many balance exercises. 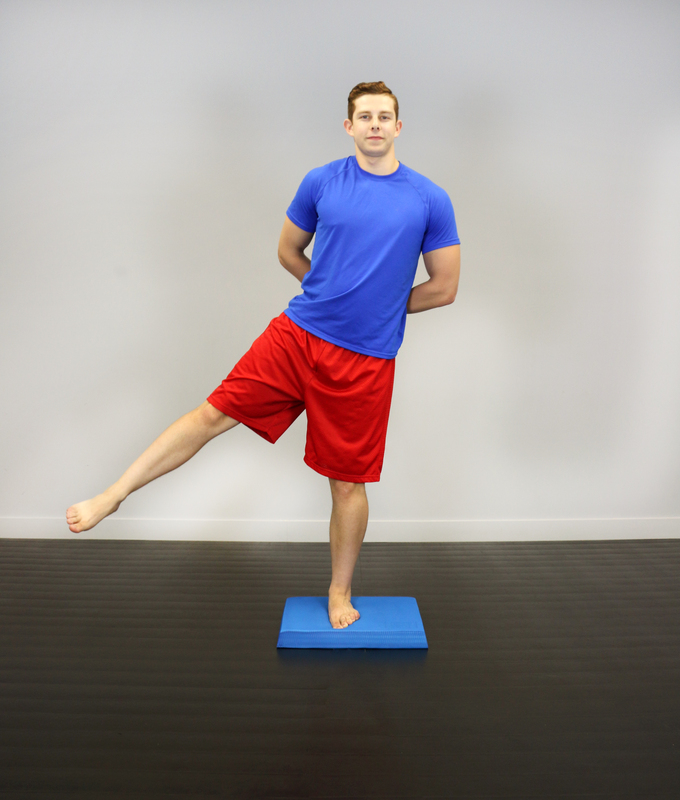 One example exercise is standing on one leg, but this time with a CanDo® Balance Pad. Using a balance pad decreases stability for a greater balance training challenge. To prevent injuries from falling, especially when you get older, you add balance training to your workout. By training at least 3 times a week, you will see improvements in your balance and gain a better quality of life. Before practicing balance training, please consult with your specialist to see what the best exercises are for you. For more information on balance training, click here. To view the MVP Balance System, click here. To view the CanDo® Balance Pad, click here.